March 29, 2016 – Hundreds of military, government and commercial satellites reside today in geosynchronous Earth orbit (GEO) some 22,000 miles (36,000 kilometers) above the Earth—a perch ideal for providing communications, meteorology and national security services, but one so remote as to preclude inspection and diagnosis of malfunctioning components, much less upgrades or repairs. Even fully functional satellites sometimes find their working lives cut short simply because they carry obsolete payloads—a frustrating situation for owners of assets worth hundreds of millions of dollars. With no prospects for assistance once in orbit, satellites destined for GEO today are loaded with backup systems and as much fuel as can be accommodated, adding to their complexity, weight and cost. But what if help was just a service call away? DARPA’s new Robotic Servicing of Geosynchronous Satellites (RSGS) program intends to answer that question by developing technologies that would enable cooperative inspection and servicing in GEO and demonstrating those technologies on orbit within the next five years. Under the RSGS vision, a DARPA-developed modular toolkit, including hardware and software, would be joined to a privately developed spacecraft to create a commercially owned and operated robotic servicing vehicle (RSV) that could make house calls in space. DARPA would contribute the robotics technology, expertise, and a Government-provided launch. The commercial partner would contribute the satellite to carry the robotic payload, integration of the payload onto it, and the mission operations center and staff. If successful, the joint effort could radically lower the risk and cost of operating in GEO. 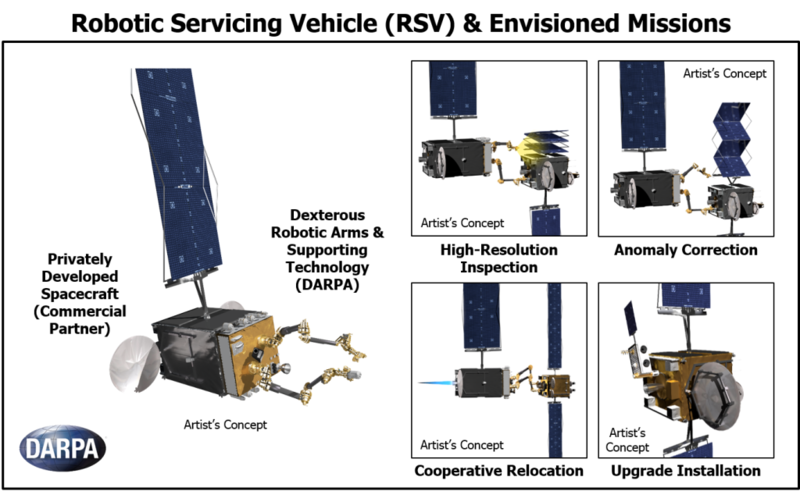 To formalize that collaboration, DARPA aims to establish a public-private partnership through which the Agency would develop and provide technical capabilities for transition to a commercial space robotics enterprise that would make cooperative robotic servicing available to both military and commercial GEO satellite owners on a fee-for-service basis. DARPA seeks to engage a commercial partner with a strategic interest in this capability, and an interest in providing services to the Defense Department (DoD). After a successful on-orbit demonstration of the robotic servicing vehicle, U.S. Government and commercial satellite operators would have ready access to diverse capabilities including high-resolution inspection; correction of some mission-ending mechanical anomalies, such as solar array and antenna deployment malfunctions; assistance with relocation and other orbital maneuvers; and installation of attachable payloads, enabling upgrades to existing assets. Satellite operators would be able to purchase these services on request to the robotic servicing vehicle operator. A critical component of the RSV would be the robotic arm developed by DARPA known as FREND. Constructed to enable automated, cooperative connection to satellites that are not designed for docking, the FREND arm has multiple joints enabling dexterous movement and can carry and switch among multiple generic and mission-specific tools. DARPA will augment the arm by adding advanced algorithms for machine vision and supervised autonomous robotic operations. Also new will be onboard mission-planning software and a variety of sensors designed to provide reliable, high-fidelity spatial orientation information, essential for safely guiding the spacecraft with its robotic systems on orbit. DARPA plans to kick off the public-private partnership via a Program Solicitation in the near future. Shortly thereafter, DARPA will host a Proposers Day to provide potential partners with further technical and programmatic details about the RSGS program. The date of issue of the Solicitation and the date and location of the Proposers Day have yet to be determined. Both will appear on the Federal Business Opportunities website (www.fbo.gov).